Photo: Darren Bundock flying upwind in Australia in back in Oct 26. - I wanted to confirm the onsite report from the Australian nats first hand, and Bundy confirmed he foil upwind during the races yesterday along Steve Brewin. 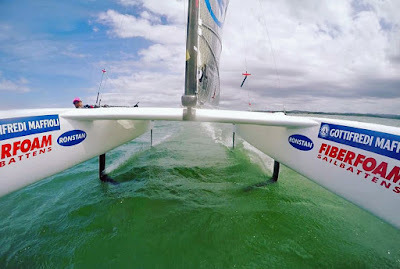 Upwind foiling has been tried while racing already in Medemblik and other events by Mischa Heemskerk but I least I don´t have reports from being used as norm upwind but mainly as tactical move. We've published videos from him, Sandro and local riders. But all the tests we've done here showed and confirmed it never paid against another A in good floating upwind mode. If Darren Bundock says he is foiling upwind while racing , well that is what is going on in Australia right now. Bundy reached the top mark first n all 3 races, with Brewin having a better downwind perf along Collet who scored a bullet on a great final leg. he also reports on a very patchy breeze with big gains and losses for downwinds. The As as reported yesterday are slowly reaching the point of 100% foiling mode, still much to go though and surely Sopot will put the As into the next realm. We are waiting for shots from the first day, stay tuned.